Charles William Kelsey (1877–1975) was a Canadian artist best known for his stained glass work. He was born in 1877 in England. He trained in England. He emigrated to Montreal, Quebec in 1922. He designed and painted stained glass windows with the Montreal Art Glass Works. His stained glass designs can be found in England, Australia, the United States and in over sixty-eight churches in Canada. His main patrons were the Anglican and United Churches. 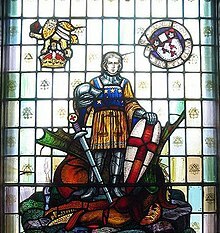 In Memorial Hall, McGill University, there are two Stained Glass Regimental badge World War I and World War II Memorial Windows by Charles William Kelsey c. 1950/1. The torture of the eight North American Martyrs by North American Indians are the subjects depicted in the twelve-light World War I memorial window (1933) by Charles William Kelsey at the Loyola College (Montreal) chapel. The three light congregational war memorial window (1949) by Charles William Kelsey at St. George's Anglican Church (Montreal) depicts angels holding shields representing the Navy, Army and Air Force. Below the Army panel is written "He will swallow up death in victory and the Lord God will wipe away all tears from all faces, Isaiah 25:8." Below the Air Force Panel is written "Out of weakness made strong, waxed valiant in fight, turned to flight the armies of the aliens, Hebrews II:34". Below the Navy Panel is written "They that go down to the sea in ships, these see the works of the Lord and His wonders of the deep, Psalm 107:23". A World War I memorial window (1924) by Charles William Kelsey depicting a trench scene was dedicated at St. James United Church (Montreal) to 32 members who were killed overseas and 267 others who served in the Great War. The side lights represent the cardinal virtues, Justice, Prudence, Temperance and Fortitude. This page was last edited on 15 June 2017, at 17:43 (UTC).